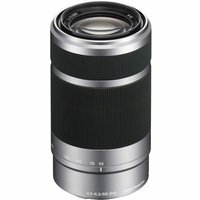 The Sony E55-210mm f4.5-6.3 OSS Lens with Sony E-mount features a 3.8x zoom range, optical SteadyShot image stabilisation and smooth, quiet autofocus for both still and HD movie shooting. The lens is suitable for wildlife and sports photography, as well as for all-purpose shooting. The high-performance optic has two aspherical elements for excellent optical performance and a 7 blade circular aperture for lovely defocus effects. Optical SteadyShot image stabilisation within the lens delivers crisper, clearer handheld shooting at all zoom settings.